How can I know that I am getting the best deal between a bag of apples or a bushel of apples? A rate is a kind of ratio that compares two quantities of different units. Ratios can be used to solve percent problems and convert units. 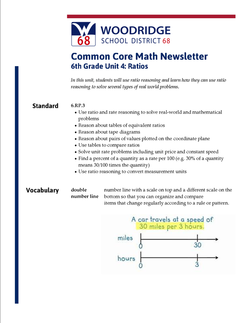 6.RP.A.3.A Make tables of equivalent ratios relating quantities with whole-number measurements, find missing values in the tables, and plot the pairs of values on the coordinate plane. Use tables to compare ratios. 6.RP.A.3.D Use ratio reasoning to convert measurement units; manipulate and transform units appropriately when multiplying or dividing quantities. 6.RP.A.1 Understand the concept of a ratio and use ratio language to describe a ratio relationship between two quantities. For example, "The ratio of wings to beaks in the bird house at the zoo was 2:1, because for every 2 wings there was 1 beak." "For every vote candidate A received, candidate C received nearly three votes." 1 Expectations for unit rates in this grade are limited to non-complex fractions. I explain that a ratio shows the relationship between two quantities. I can use ratio language to describe two amounts. I can read a ratio. I can write a ratio in various formats. I can make a table of equivalent ratios. I can find missing values in a table of equivalent ratios. I can plot values from a table of equivalent ratios on a coordinate plane. I can find equivalent ratios using a graph. I can use a tape diagrams to represent data and help organize ratio reasoning. I can use double line graphs to represent data and help organize ratio reasoning. I can use equations to represent data and help organize ratio reasoning. I can identify and create part to whole ratios. I can identify and create part to part ratios. I can identify and create a rate which is a special type of ratio. I can use ratio reasoning to solve for the unit rate of a given rate. I can use ratio reasoning to solve for unit price of a given rate. I can find the desired unit of measure using ratios and multiplication. I can solve word problems involving units of measurement. I can use ratio reasoning to find the percent of a quantity as a rate per 100. I can use ratio reasoning to find the whole, given a part and a percent. I can solve world problems that ask me to find a percent. I can solve world problems that ask for the whole, given a part and a percent.